The seawall of Maasvlakte 2 is particularly suitable for generating renewable energy from wind. The future wind turbines will be placed on a strip of about 7.5 kilometers long, located at a considerable distance from habitation and in a very windy area. The aim of Rijkswaterstaat is to purchase as much green energy as possible as from 2023. Rijkswaterstaat prepared the tender in collaboration with the local partners Port of Rotterdam Authority, City of Rotterdam, Province of South Holland, Ministry of Economic Affairs and Climate and the Central Government Real Estate Agency. A joint effort has been made to improve the conditions under which the wind farm will be developed. The City of Rotterdam irrevocably adopted the Maasvlakte 2 zoning plan - which makes the wind farm possible - last year. At present, Rijkswaterstaat is still conducting studies (ecology, flood risk management) in preparation for the application for permits by the future operator in order to speed up the progress of the development the wind farm. The Dutch stimulation of sustainable energy production (SDE+) provides a subsidy which is available on this location in the category "Wind on primary flood defenses". Rijkswaterstaat encourages parties to realize as much production as possible on site. In the tendering procedure, Rijkswaterstaat aims to provide intensive support to those interested in this project, for example through information meetings, consultation rounds and the sharing of ongoing investigations. 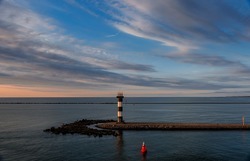 With this, Rijkswaterstaat wants to provide sufficient information on, among other things, planning and the award criteria to enable interested parties to bid quickly and effectively on this project. Rijkswaterstaat will itself purchase the green energy produced for 25 years through a PPA. The wind farm thus contributes to an energy-neutral Ministry of Infrastructure and Water Management.